The most innovative and versatile heat treatment control system available today. Ice Star designs, engineers and manufactures heat treatment controllers for electric and gas furnaces, as well as for induction and resistive heating consoles. Hotfoil-EHS is the exclusive distributor for Ice Star in the United States, Canada, and Mexico. Precise control over your pre-weld and post-weld heat treatment parameters are critical. Accurate temperature control, specific soak times, uniformity, and controlled heat up and cool down times are required to ensure strong welds. Hotfoil-EHS power consoles are designed to provide the best control, easiest user interface, and longest lasting operation, even in the toughest environments. Using only the highest quality components, Hotfoil-EHS power consoles are field-tested and application proven. Control systems can be specified with or without recorders or ramping controllers, and are standardly available in 6, 9, 12, 18, and 24 zone configurations. 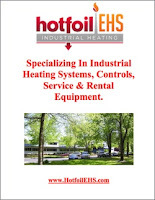 Hotfoil-EHS is a New Jersey based company who will design and fabricate custom heat treatment furnaces. From small, low-throughput furnaces, to high yield furnaces, to rail-driven furnaces designed to move back and forth over the materials being heated, Hotfoil-EHS has done it all. 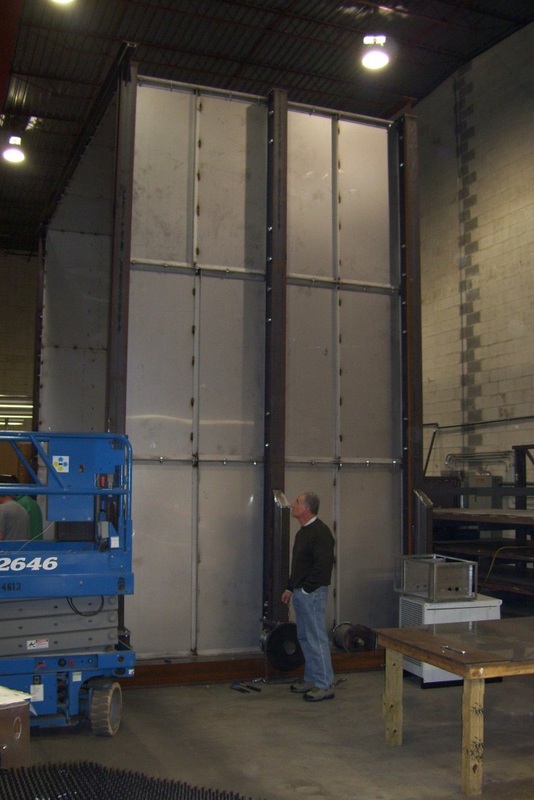 From decades of experience in furnace production, many important furnace engineering discoveries were made that save time, money, and improve the end product. Contact Hotfoil-EHS for your next heat treatment furnace requirement. 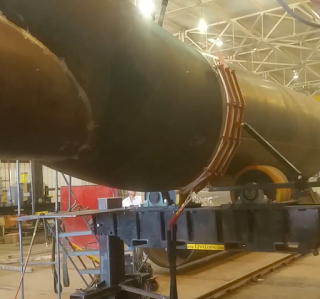 The video below demonstrates the erection of a 16' x 16' x 62' heat treat furnace built out of a 6x6 I-Beam skeletal structure with 11 gauge steel skin. 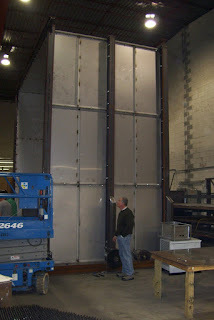 Full size doors, two per end, will allow the furnace to heat loads using it's full volume. The furnace is equipped with eight 3-Million BTU burners, one at either end and 3 down each side, to circulate the air. Four dampers are included, two at each end. It will move back and forth on a rail system by (16) 10" crane wheels. A hydraulic system will act to lift the furnace 3" in the air off the hearth. This will allow the furnace to move freely and without damaging the insulation on the bottom seals. It will be controlled via a remote HMI screen with full SCADA capabilities. For more information, visit http://www.hotfoilehs.com or call 609.588.0900. Hotfoil-EHS designs and manufactures custom mobile rigs for remote heat treatment applications. Custom designs include a variety of generator sizes, power consoles, interior workspaces and layouts, air conditioning, and easy access to all electrical components. For more information, visit http://www.hotfoilehs.com or call 609-588-0900. 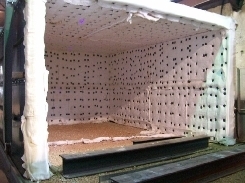 Interior view of heat treating furnace. Heat treating refers to the heating and cooling operations performed on metal work-pieces to change their mechanical properties, their metallurgical structure, or their residual stress state. Heat treating includes stress-relief treating, normalizing, annealing, austenitizing, hardening, quenching, tempering, martempering, austempering, and cold treating. Annealing, as an example, involves heating a metallic material to, and holding it at, a suitable temperature, followed by furnace cooling at an appropriate rate. Steel castings may be annealed to facilitate cold working or machining, to improve mechanical or electrical properties, or to promote dimensional stability. 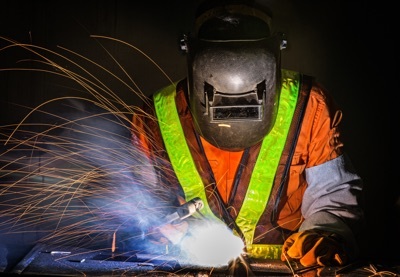 Steel vessels, girders, pipes, and structures are heat treated prior to, and after welding to improve weld quality and strength. Gas fired furnace used for heat treating. 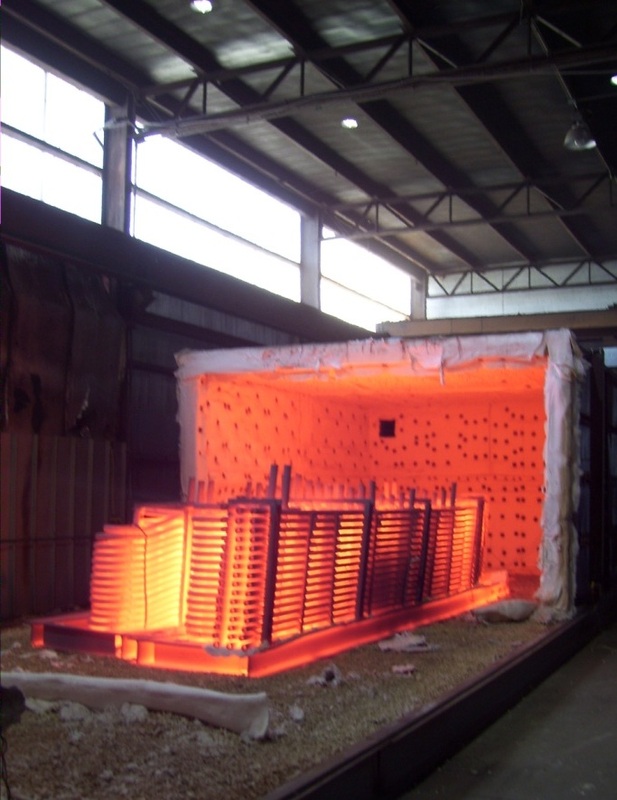 Heat treating is performed in conventional furnaces, salt baths, or fluidized-bed furnaces. The basic conventional furnace consists of an insulated chamber with an external reinforced steel shell, a heating system for the chamber, and one or more access doors to the heated chamber. Heating systems are direct fired or indirect heated. With direct-fired furnace equipment, work being processed is directly exposed to the products of combustion, generally referred to as flue products. Gas- and oil-fired furnaces are the most common types of heat treating equipment. Indirect heating is performed in electrically heated furnaces and radiant-tube-heated furnaces with gas-fired tubes, oil-fired tubes, or electrically heated tubes. Non-contact temperature measurement technology allows process operators and technicians to evaluate the temperature of process materials, machinery, or piping by measuring their electromagnetic radiation. Through inferential calculation and one or more radiation measurements, specialized instruments can determine temperature without contacting the subject material or surface. While the concept of non-contact measurement technology has existed for many years, more recent advancements in non-contact temperature sensing and the evolution of the pyrometer have allowed temperature measurement at a distance to become popular throughout industrial process operations. Pyrometers can commonly concentrate light from an object onto a temperature sensing element. The sensed elevation in temperature is proportional to the infrared optical energy. Different instruments may have varying arrangements of concentrating lenses and sensors, but the operating principle is the same. The physical law behind the pyrometer's operating principle operates on an exponential mathematical basis that is non-linear. This results in one of the limitations of the pyrometer. A single pyrometer can only, with high accuracy, deliver a comparatively narrow range of target temperature. If the need for accuracy is reduced, the applicable temperature range widens. Innovative manufacturers have developed instruments with technology and features overcoming many of the limitations imposed by the physics, delivering instruments with accuracy and applicable temperature range usable in a wide array of applications. 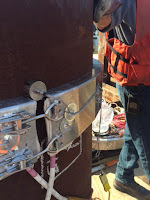 One of the advantages to using a non-contact pyrometer is that their calibration is independent of the distance between the sensor and the object being evaluated. This phenomenon is due to the fact pyrometers have a field of view and can be filled with the target object in a way independent of distance. While the radiation emanating from the target object may be decreasing, the field of view of the pyrometer is measuring a greater portion of the object which is proportional to the amount of radiation being lost, essentially canceling out the distance and allowing the pyrometer to provide useful output. An example of a practical application of a pyrometer in industry would be its use to check the temperature of a ventilation system in the HVAC field. Share your temperature measurement requirements and challenges with process instrumentation specialists. Their product application expertise will combine with your own process knowledge and experience to produce an effective solution. With fuel-based systems, heat is generated by the combustion of solid, liquid, or gaseous fuel, and transferred either directly or indirectly to the material. The combustion gases can be either in contact with the material (direct heating), or be con ned and thus be separated from the material (indirect heating, e.g., radiant burner tube, retort, muffle). Examples of fuel-based process heating equipment include furnaces, ovens, kilns, lehrs, and melters. Atmosphere generators. Used to prepare and/or condition protective atmospheres. Processes include the manufacture of endothermic gas used primarily to protect steel and iron during processing, and exothermic gas used to protect metals, but also to purge oxygen or volatile gases from con ned areas. Blast furnaces. Furnaces that burn solid fuel with a blast of air, often used to smelt ore.
Crucible furnaces. A furnace in which the heated materials are held in a refractory vessel for processes such as melting or calcining. Dryer. 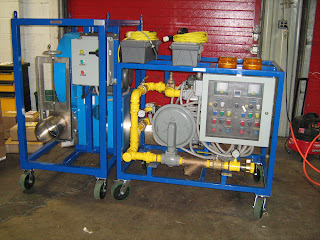 A device that removes free water, or other volatile components, from materials through direct or indirect heating. Dryers can be grouped into several categories based on factors such as continuous versus batch operation, type of material handling system, or source of heat generation. Indirect process heaters. Used to indirectly heat a variety of materials by remotely heating and circulating a heat transfer uid. Lehrs. An enclosed oven or furnace used for annealing, or other forms of heat treatment, particularly in glass manufacturing. Lehrs may be the open type (in which the flame comes in contact with the ware), or the muffle type. Muffle furnaces. 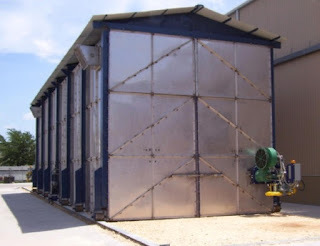 A furnace in which heat is applied to the outside of a refractory chamber or another enclosure containing the heated material that is enveloped by the hot gases. The heat must reach the charge by flowing through the walls of the container. Ovens. A furnace-like chamber in which substances are heated for purposes, such as baking, annealing, curing, and drying. Heated systems can use forced convection or infrared. Radiant-tube heat-treating furnaces. Used for processing iron, steel, and aluminum under a controlled atmosphere. The flame is contained within tubes that radiate heat to the work. Processes include carburizing, hardening, carbo-nitriding, and austempering. The atmosphere may be inert, reducing, or oxidizing. Reverberatory furnaces. Furnaces in which open flames heat the upper portion of a chamber (crown). Heat is transferred to the material mainly by radiation ( flame, reflection of the flame by the crown) and convection (combustion gases). Salt bath furnaces. Metal pot furnaces filled with molten salt where heat is applied to the outside of the pot or inside of the pot by radiant tube. Salt bath furnaces are used for processes such as heat treating metals and curing plastics and rubber. Solid waste incinerators. Used to dispose of solid waste material through burning. Thermal oxidizers. Used to oxidize volatile organic compounds (VOC) in various industrial waste streams. Processes include paint and polymer curing and/or drying. The principles of induction heating have been applied to manufacturing operations since the 1930s, when the first channel-type induction furnaces were introduced for metals melting operations. Soon afterward, coreless induction furnaces were developed for melting, superheating, and holding. In the 1940s, the technology was also used to harden metal engine parts. More recently, an emphasis on improved quality control has led to increased use of induction technology in the ferrous and nonferrous metals industries. In a basic induction heating setup, a solid state power supply sends an alternating current (AC) through a copper coil, and the part to be heated is placed inside the coil. When a metal part is placed within the coil and enters the magnetic eld, circulating eddy currents are induced within the part. These currents ow against the electrical resistivity of the metal, generating precise and localized heat without any direct contact between the part and the coil. An induction furnace induces an electric current in the material to be melted, creating eddy currents which dissipate energy and produce heat. The current is induced by surrounding the material with a wire coil carrying an electric current. When the material begins to melt, electromagnetic forces agitate and mix it. Mixing and melting rates can be controlled by varying the frequency and power of the current in the wire coil. 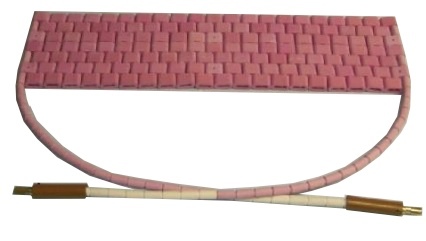 Coreless furnaces have a refractory crucible surrounded by a water-cooled AC current coil. Coreless induction furnaces are used primarily for remelting in foundry operations and for vacuum refining of specialty metals. Channel furnaces have a primary coil wound on a core. The secondary side of the core is in the furnace interior, surrounded by a molten metal loop. Channel furnaces are usually holding furnaces for nonferrous metals melting, combined with a fuel- red cupola, arc, or coreless induction furnace, although they are also used for melting as well. The efficiency of an induction heating system for a specific application depends on several factors: the characteristics of the part itself, the design of the induction coil, the capacity of the power supply, and the degree of temperature change required for the application. Induction heating works directly with conductive materials only, typically metals. Plastics and other nonconductive materials often can be heated indirectly by first heating a conductive metal medium that transfers heat to the nonconductive material. With conductive materials, about 80% of the heating effect occurs on the surface or “skin” of the part. The heating intensity diminishes as the distance from the surface increases, so small or thin parts generally heat more quickly than large thick parts, especially if the larger parts need to be heated all the way through. Induction heating can also be used to heat liquids in vessels and pipelines, primarily in the petrochemical industry. Induction heating involves no contact between the material being heating and the heat source, which is important for some operations. This lack of contact facilitates automation of the manufacturing processes. Other examples include heat treating, curing of coatings, and drying. Induction heating often is used where repetitive operations are performed. Once an induction system is calibrated for a part, work pieces can be loaded and unloaded automatically. Induction systems are often used in applications where only a small selected part of a work piece needs to be heated. Because induction systems are clean and release no emissions, sometimes a part can be hardened on an assembly line without having to go to a remote heat treating operation. When it comes to Hotfoil-EHS power consoles, there's no cutting corners. By using thicker gauge sheet metal and tubing, top quality electrical components, and quality craftsmanship, Hotfoil-EHS power consoles provide years of reliable and trouble-free service. Power consoles are standardly offered in 6, 9, 12, 18, and 24 zone configurations with a variety of control and recording systems. 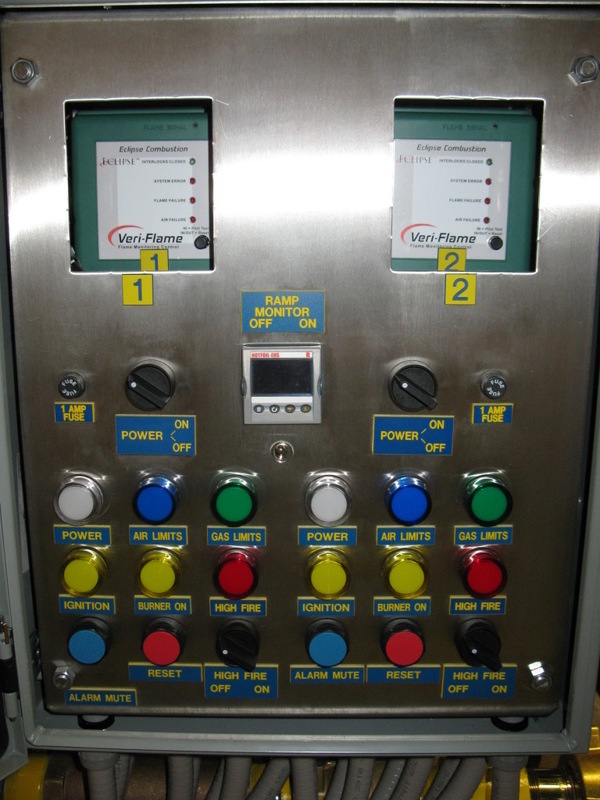 All Hotfoil-EHS power consoles are available in Stainless Steel and can be customize to your requirements. Have a special requirement? Just ask. Need a special color, coating or controls? Hotfoil-EHS is eager to provide a custom power console to meet your exact needs. Temperature recorders are available for applications requiring documentation and certification. Fully automatic controllers are provided when specific heat-up and cool-down profiles are needed. Hotfoil-EHS Heat Treatment Power Consoles from Hotfoil EHS, Inc. Ceramic mat heater: Proven performance over time. Heat treating large metal surfaces in the field before and after welding is usually a challenge. Over the years, products have been developed that perform well and withstood the test of time. One of these products is the ceramic pad heater. 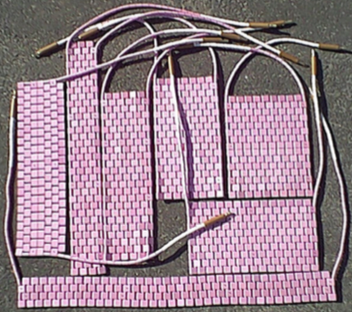 Ceramic pad heaters (also known as mat heaters) are constructed of interlocking sintered alumina ceramic beads (usually pink or white in color) which insulate an 80/20 Nickel/Chrome multi-strand wire (the resistance element). Ceramic pad heaters are designed for most pre-heat and post-heat treatment requirements on weld joined materials (stress relieving). Available in numerous sizes, shapes, configurations, voltages and wattages, they can be used up to 2150°F in various weld heat treating applications. process as well as more efficiently retain the heat for soaking. For more information on the use and installation of ceramic pad (mat) heaters, visit Hotfoil-EHS at www.hotfoilehs.com or call 609.588.0900. With decades of experience in challenging applications, and thousands of successful installations, Hotfoil-EHS maintains their well deserved reputation as the highest quality and most competitively priced manufacturer of heat treat power consoles in the world. Heat treating isn’t done in a laboratory, or a clean room. Applications are out in the real world, where dirt, grease and grime are normal. Hotfoil’s new induction heater is designed to work in the toughest conditions, and continue to run shift after shift. Induction heating works very quickly, and since there is no contact with the target piece, there are far less concerns about part contamination. Many industrial processes use induction heating when very high temperatures and uniform control is desired. Pre and post-weld heat treating (stress relieving) is a growing market for induction heating systems because it offers significant benefits such as excellent heat placement and distribution, lower cycle times, safety, ease of use, and efficiency. Induction heating can improve your bottom line by decreasing weld failures, and decreasing setup and tear down times. The technology allows for accurate temp control, without heavy electrical service or complicated controls. The portability and ease of use will allow you to heat more welds faster. 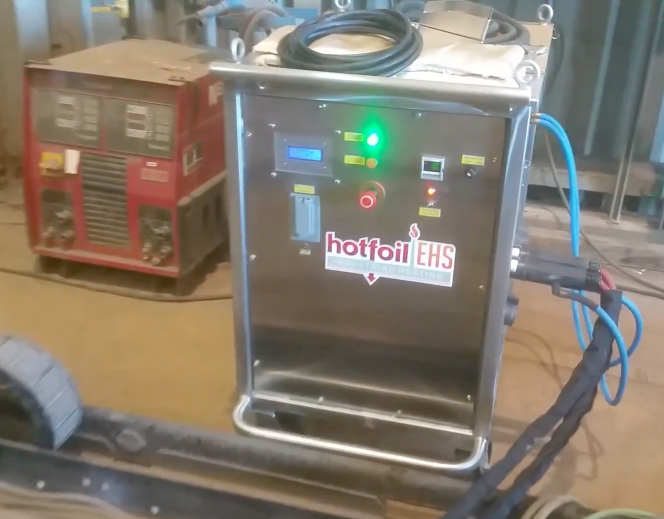 The Hotfoil-EHS Fusion45 Induction Heater from Hotfoil EHS, Inc. The item on gas fired heat treating equipment that produces and controls the heat is generally referred to as the “Gas Train.” Its job is to properly and safely mix the fuel / air together and cause combustion. The blower introduces and mixes atmospheric air with the available fuel to create combustion. Blowers come in many sizes and velocities to accommodate the combustion required for the work. Common blower sizes are 10HP and 15HP motor and can move up to 2200 cubic feet/minute. Regulates the total volume of fuel available to the burner and available to mix with the combustion air. Includes regulating valves and ignition control system. The control system's primary purpose is to control the volume of fuel to the burner, assure that proper gas pressure is available, monitor for the presence of flame, and provide alarms and shutdown in the event of flameout or loss of fuel supply. Safety is paramount for gas trains, so many safety components are designed in the control system. Examples are redundant pilot and main valves, UV sensors, high and low gas pressure switches, power/kill switches, master/slave controllers, warning lights, and purge components to expel gas from the system. Provides the required voltage to create an arc sufficient to light the burner. The ignition system is used to ignite the fuel / air mix - once the ignition takes place, the ignition system is no longer active. Electrical system includes circuit breakers for high and low voltage, starter contactors with over-load, and 750vA transformers for low voltage side. Where the mix of fuel and air combusts and expels a high velocity / high BTU flame as the thermal energy source. Common sizes for burners are 6-10 million BTU, 3-6 million BTU, and 1 million BTU. Features commonly included are separate air and gas connections, UV hook-up, spark ignitors, ample lengths of air and gas hoses. Watch the video below for a great visual on how a gas train works! For more information, contact Hotfol-EHS at www.hotfoilehs.com or call 609.588.0900. Electric Heating Systems, Inc. (EHS), established in 1994 in Robbinsville, NJ, is a designer and supplier of turnkey, permanent low temperature heating systems for the electric power and tank fabricating industries. Later, this division's name was changed to Hotfoil, and the EHS division began manufacturing ceramic mat (pad) heaters, power consoles, and accessories for the heat treating industry. Hotfoil-EHS is now a major manufacturer and producer of standard and custom designed industrial heat treating products with an exhaustive inventory including custom control panels, heat treating power consoles, cables and splitters, temperature recorders, thermocouple attachment units and pin guns. You can download the latest product catalog here. This new video illustrates the variations in design and custom capabilities Hotfoil-EHS has for building specialized power consoles. Special power requirements, corrosion-resistance, weather-proofing, custom paint or coatings, special control options and custom cable sets are all available from Hotfoil-EHS. Challenge them with your toughest heat treating requirement. You'll be pleasantly surprised with the response. The Tappan Zee Bridge stretches over the Hudson River and connects South Nyack, NY with Tarrytown, NY. The original bridge, completed in 1955, was only intended to last 50 years. Construction on a new, $3.9 billion replacement bridge started in 2013 and is scheduled for completion in 2018. 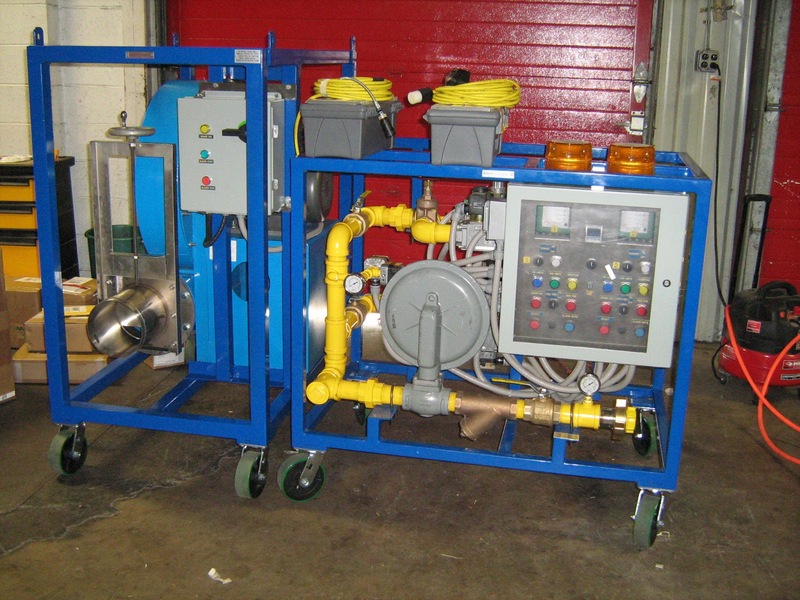 Hotfoil EHS is working closely with the bridge contractors supplying welding heat treating equipment. Large metal structures, such as bridge supports, pilings, and girders need careful pre-heating and post heating to ensure strong, lasting welds. 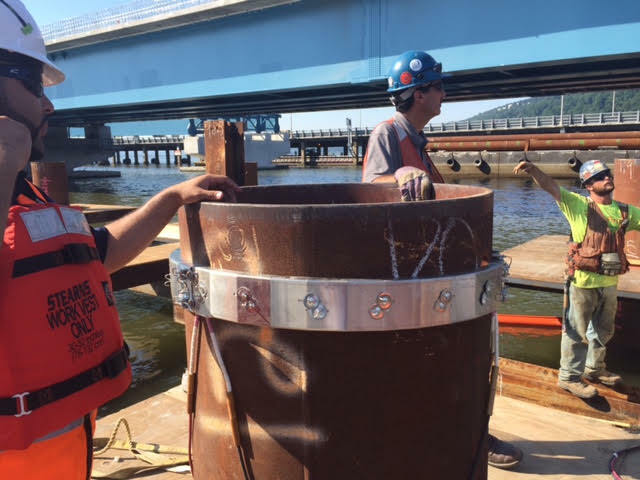 Contractors on the Tappan Zee Bridge specified Hotfoil EHS power consoles, electric heaters, and thermocouples for their welding heat treating requirements. 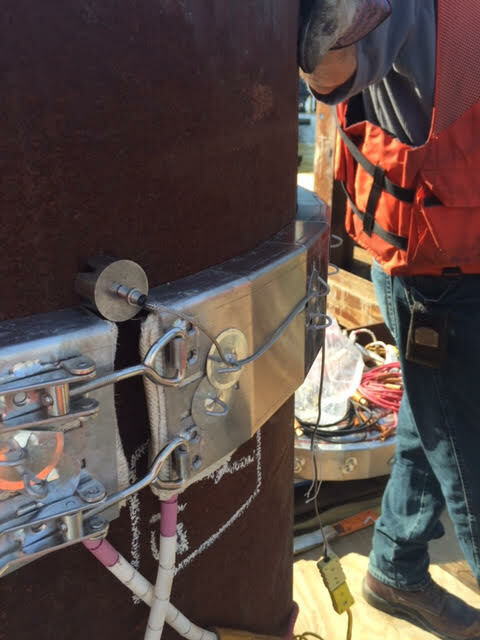 Here are photos from the pre-heating of piling welds. The applications uses "clam shell" heaters with magnetic thermocouples. The clam shell heaters are named that because of their hinged design, making it easy to place them around large, round workpieces. The magnetic thermocouples are very convenient because the magnets keep them firmly in place and are quick to remove. A Hotfoil 6-way (six zones) power console is used to control the temperature of the workpiece by controlling the power provided to the clam shell heaters. For more information, visit http://www.hotfoilehs.com. 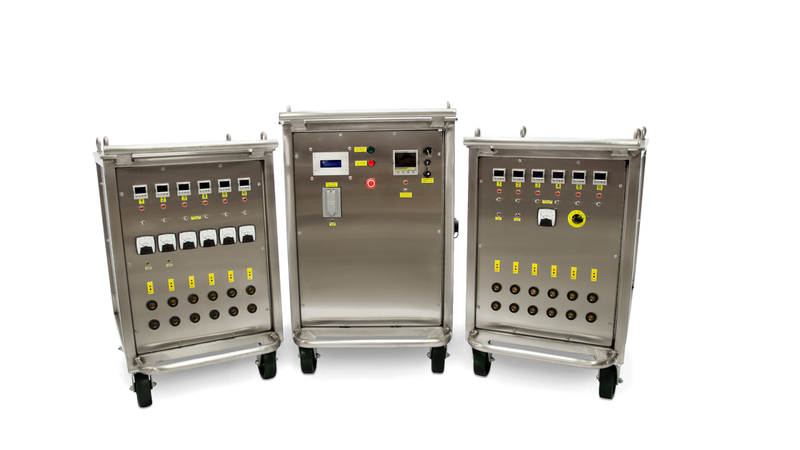 Standard heat treating power consoles available from a variety of manufacturers pretty much cover the same set of basic welding requirements. In many field situations however, there can be unusual circumstances such as difficult locations, available power sources, and environmental concerns. 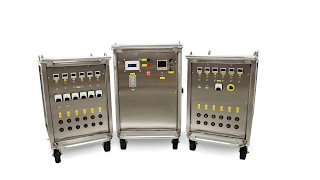 In these situations custom manufactured power consoles will provide welding outcomes with fewer operational problems, higher quality output, and greater safety. Standard power consoles are available 3, 6, 9, 12, 18, 24 and 36 zone configuration (zones are many times referred to as "way" such as 3 way console, 6 way console, 9 way console, etc.) Each zone provides a point of control. The type of control can vary depending on the requirement of the weld. Some zones only need simple on-off or proportional control. Some welding jobs require more sophisticated temperature control profiles, thus requiring tight control with temperature vs. time ramping. Additionally, these more sophisticated control requirements may also need data logging or recording for quality compliance. In many situations custom cable sets are required to deliver the heater power and thermocouples to the workpiece. A power console manufacturer should have the experience and knowledge to consult, recommend, and install whatever zone control and cabling requirements your job needs. The operating environment is another important consideration for power console customization. Standard power console cabinets are usually made from a medium gage sheet metal and painted with an industrial grade rust-resistant paint. While fine for relatively dry and non-corrosive atmospheres, these are subject to quick deterioration when moved into areas where higher than normal concentrations of salt, chlorine, or other corrosive gasses exist. In these situations, careful consideration of exposed materials needs to be applied. Perhaps an all stainless steel design is needed? Or maybe special corrosion resistant paints or epoxy resins should be specified? Or maybe you only need a special color paint? Working with a power console manufacturer who has the flexibility in their manufacturing process and experience on the floor to provide these options is preferred. Finally, look for a power console manufacturer who can handle unusual power system requirements. A manufacturer who can adapt their systems to unique voltages and current requirements is a big plus. Look for an equipment company that has experience and production capabilities for a wide variety of transformers - single or dual- and can even supply custom built transformers. And of course, always try and find equipment built right here in the USA. Resistance heating mats (or pads) are constructed of ceramic beads strung on nichrome or Kanthol wire. These resistance heating elements accurately heat the workpiece to the proper temperature before, during, and after welding, assuring compliance with recommended preheat, interpass, and PWHT practices. Designed as semi-flexible ceramic heater pads, with interlocking beads and high temperature wire, so a proper fit to the workpiece. Capable of temperatures up to 1,850 degrees F., ceramic mat (pad) heaters have an additional benefit in that they can withstand welding temperatures and don’t have to be moved during welding. Resistance Heating Mats for Welding Pre and Post Heat Treatment from Hotfoil EHS, Inc.